As the holiday season draws close, nearly every blog I visit is abuzz with handmade gift ideas. Eco-awareness and a rough economy have collided to bring us back to what really matters during the holiday season - meaningful gifts created with love. Many gift ideas for children are things we can make them. While those are important - to judge from the contents of my knitting basket, very important - they are just one way we can give to our children this holiday season. Another is to involve our children in the hand-making process, both by teaching them what we know and by giving them gifts that transform them into the crafters of tomorrow. Inaugurate a Knitter: The first step to knitting for kids doesn't involve needles and requires nothing more than a sturdy index finger and a ball of leftover yarn. 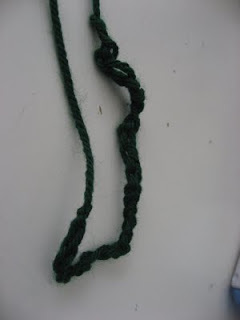 Follow these easy directions to teach your kids how to finger knit. Their creations can become garland for the Christmas tree, a belt, headband or bracelet to wear, bookmarks for gifts, or hair for that rag doll you've wanted to make for your child ever since reading Little House in the Big Woods. Once, they've mastered finger knitting, kids can learn knitting with needles or crocheting. Sew Kiddo Sew: Sew Mama Sew has a fantastic roundup of first sewing projects for kids. Last weekend, the boys and I made a pennant with scraps (e.g., pants and pajamas with too many holes to patch), thrifted embroidery floss and my great grandmother's pinking shears. Awaken the Artist: The Creative Home by blogger extraordinaire, Soule Mama, is a fantastic collection of tips and ideas for fostering creativity in young children. (Thank you, Jess, for lending it to me! You might never get it back.) Ms. Soule focuses on eco-art ideas such as repurposing items, reusing things headed for the landfill, incorporating things found in nature, and filling the cart at the thrift store or garage sale to stock the art cupboard. Other ideas we've picked up over the years is keeping supplies organized, making it easy for kids to clean up, and providing a work space where they can let the artistic juices flow. - A sewing kit: Instead of more toys my kids don't need, my mom is putting together sewing kits for them. She's using fabric scraps, thrifted buttons, extra thread, my grandmother's thimbles and needles, and my leftover yarn. Containers can include secondhand baskets or sturdy boxes, decorated oatmeal containers or coffee cans. Imagination is the only limit. - A basket for knitting/crocheting: Kids' first needles or a large crochet hook (G or H) along with some colorful yarn. I've managed to pick up most of my crochet hooks at garage sales and thrift stores. Ditto for some of my knitting needles. Our local thrift store usually has bagged yarn for a bargain and more baskets than you can shake a needle at. - Tools and tool box: Depending on age, you can start with a few tools or fill a box. When our boys were very very young, we gave them each a tool box. Each year, we buy one additional, high quality tool for them. First, it was a screwdriver, then a measuring tape, next a hammer. I'll have to ask my husband what it will be this year. Perhaps that "square" tool thing? Doing tools one at a time or buying second hand tools at garage sales, flea markets or estate sales is a great way to save resources - financial and natural. - First pocket knife: For older children, a pocket knife can lead to a world of self sufficiency. - A child-size desk or table to use for art: It can be extremely inexpensive to outfit your budding artist with some creative space. Both of my boys have some dedicated art space in their rooms. One has a sturdy wooden picnic table covered in oil cloth and discovered at a local thrift store for $25. The other is enjoying a new to him desk purchased at an antique faire for $35 (it included the chair!). A desk or table can be free too if you've got something sitting in the attic, at grandma's house or even on the roadside that can be converted. - Handmade lacing cards: For the younger set, The Creative Home has instructions on how to make wonderful lacing cards (Sorry, cannot find any photos online. You'll have to check the book out at the library.) All that is required is some very minimal drawing talent, cardstock, a hole punch and some yarn. Frugal and creative! - Framing the masterpieces: Via maya*made, I came across the coolest - and cheapest - way to help my little artists show off their creations. It involves a used FedEx overnight box, some stamps and a craft knife. - Art supplies: Last year, my son got a (now well used) easel, recycled paper, and a variety of art supplies. True, some art supplies do need to be purchased new but you'd be surprised what you might find lying around the house or at thrift stores and yard sales. A jar full of interesting buttons, saved from new clothes, from clothes beyond repair or purchased from an estate sale or antique faire is a fun gift and opens up endless opportunities. Counting, sorting, sewing, gluing. We've nabbed sets of colored pencils, small canvases, chalk pastels, fabric, paintbrushes, and bagged pompoms second hand. My ribbon box - stuffed with ribbons from packages past - has been employed to create hot air balloons, hang gliders, leashes, and belts. Open access to it delights my kids more than a new Lego set. - Dress up gear: If you are handy with a sewing machine, you can whip up an infinite number of dress items for your kid. If you, like me, are not so handy, NOW is the time to get out there and pick up some second (or third hand) costumes. In October, our thrift stores bulge at the seams with cool costumes. If your loved little one already has some dress up gear, you need only sift through your closet and the closets of friends and family to find old costume jewelry, scarves, larger swathes of fabric, shoes, hats, purses and shawls to contribute. Another nice gift along these lines is something to corral the clothes. 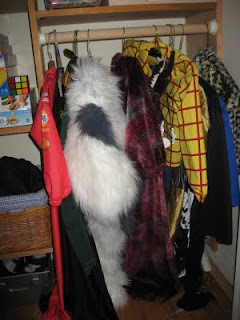 We currently hang ours in the closet but have used baskets, buckets, chests and so on in the past. In The Creative Family, SouleMama suggested using vintage suitcases, of which our thrift stores have plenty! - A cookbook and supplies: An older child who has shown some interest in recipes might enjoy a cookbook - great ones are available used - but the greatest one has been neatly copied by hand and is full of family favorites. A wooden spoon, an apron or a set of mixing bowls round out the gift. 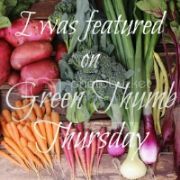 - A gardening set: A thrifted trowel or second hand shovel and some saved or purchased seeds are great for gardeners of all ages. - Give handmade: Gifts made by a family member are so meaningful. A knitted teddy bear (Wish me luck! ), a handsewn stuffie, a knitted hat (These are easy!! Great and funny tutorial here.) or a sewn truck shaped pillow. My husband plans to carve something small for each of the boys. The Simple Green Frugal Co-op has some nice ideas here. If made by you isn't in the picture, though, it is easy to support others who hand-make beautiful and environmentally friendly items. Our school hosts a craft faire in November and similar faires abound during the holiday season. Finally, of course, there's Etsy, the over-flowing website of handmade goodness. By giving our children handmade, we teach them to appreciate the unique beauty of something that is not exactly like anything else. Love the coop - tell your husband and son they did a great job! Last week on our local NPR station they had a session on backyard chickens - the link is here if you are interested. One of my friends called in to talk. She loves her chickens, and unlike me, doesn't ever worry about the cost side of things so there are no negatives in her book! YES! You are getting chickens! You will love them. Our chickens are beloved pets and my two young boys take care of them every morning before school. We gather eggs, make breakfast with them and play with them in the evening. Getting chickens was one of the best decisions I ever made. Even though I've broken up with my sewing machine, I'm getting excited about Christmas gift-making. And this post only helps build the excitement. Theresa: Thank you. I'll tell my husband you liked his handiwork. Now we just need a run and our chickens. June: I'm so glad. Thankfully, even sands sewing machine, there are oodles of fun make your own ideas out there. I'm considering getting my daughter (age 22) a sewing machine. The gene for this talent skipped a generation: Grandma is good with needle and thread, daughter is competent and creative, and I'm hopeless. Simply hopeless. I'm consulting with grandma and waiting for a sale. I love a lot of the practical ideas about buying tools, sewing machines etc. However, it can be tough to be get any of these things used/second hand and if I am buying new presents, how is that hand made? I am trying to buy homemade and second hand or hand made by others but practical and useful as opposed to useless plastic junk. I am also going to buy 100% recycled wrapping paper for those who insist on wrapping presents instead of using cloth bags or other reusable ways of packaging presents. If I were a chicken, I might choose the wood-colored coop. :) Great post. Knittingwoman: True. It is hard to find some of these items second hand. I guess my point was more to outfit our kids with tools and skills that allow them to become involved in the handmaking process. Good point, too, re not buying useless junk. Just because its handmade doesn't mean we need it. Jenn: My friend introduced it to his son who loves it so much he spontaneously asked at a play date if anyone else wants to knit. Too too cute! Donna: I'll tell my son that you said that. He'll feel super proud! I love these ideas--especially for the little ones! We've mostly done art stuff (OK an excuse for me to scrapbook) and cooking with my oldest - never thought of these other ideas. Also, if you're not the sewing type, we had great success at Goodwill finding dress-up clothes. A few of the women's short dresses can feel grown-up to someone who's 4! Very interesting. Thanks for the tips. Love it. You might as well want to know the range and quality of artist supplies I found at Christina’s Crafts. Worth Checking!